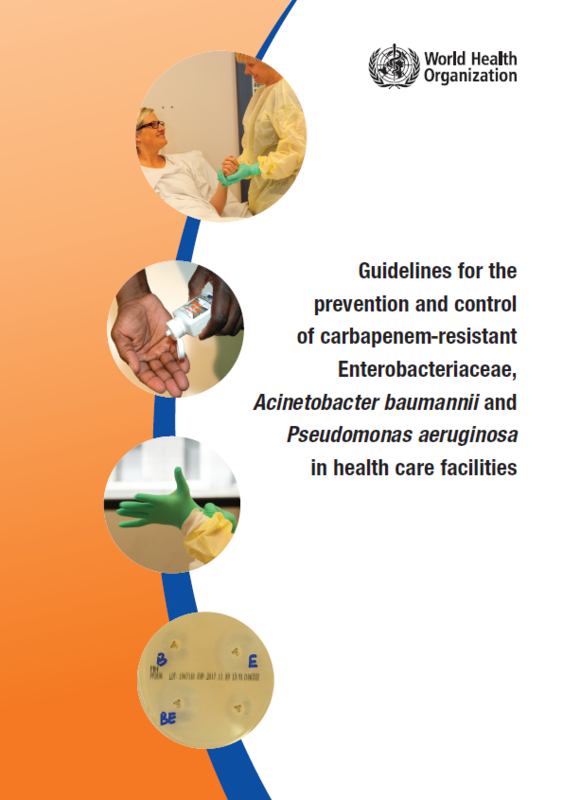 WHO have just released some guidelines for the prevention and control of carbapenem-resistant Enterobacteriaceae, Acinetobacter baumannii, and Pseudomonas aerugionsa. This guideline builds on the excellent WHO core components for IPC guidelines. I was privileged to be asked to speak at the inaugural Healthcare Infection Society Middle East Summit in Dubai this week on ‘European approaches to MDR-GNR prevention and control’. You can download my slides here. 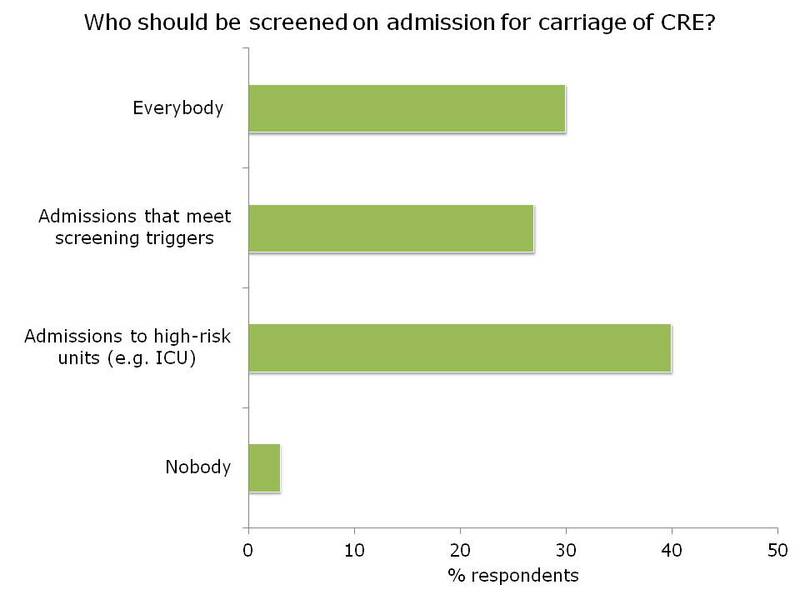 CRE is a big deal in Europe, especially in the UK, and has prompted unprecedented action on a national level in the form of a Toolkit, a Patient Safety Alert and a letter to all CEOs requesting (demanding?) an action plan. The political picture is similar elsewhere in Europe and in the USA. Although this level of government scrutiny can be challenging, on the whole I think it’s beneficial, and is probably a sizeable factor in the successes achieved with MRSA and CDI. Do we go universal or targeted? There’s been much discussion recently about abandoning traditional targeted (aka vertical) approaches in favour of universal (aka horizontal). Interesting, all guidelines that I could lay my hands on favoured a targeted approach for MDR-GNR, centred around screening and isolation of carriers. Where is the evidence? We are hamstrung by the lack of high quality studies telling us with any certainty what works to control MDR-GNR. Pretty much all studies to date are either performed in an outbreak setting (regression to the mean…) or include multiple interventions (which worked? ), or both. The few studies that evaluated a single intervention in an endemic setting are underpowered to deliver a meaningful conclusion. So, we need bigger and better studies! How do you produce good guidelines – who is on the guideline writing dream team, and what are the key pitfalls to avoid. 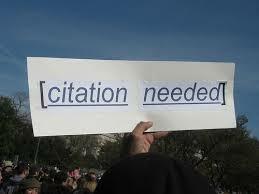 Plus, importantly, how to good guidelines translate through a good policy into good practice? I gave the third and final installment of a 3-part webinar series on multidrug-resistant Gram-negative rods for 3M recently. You can download my slides here, and access the recording here. 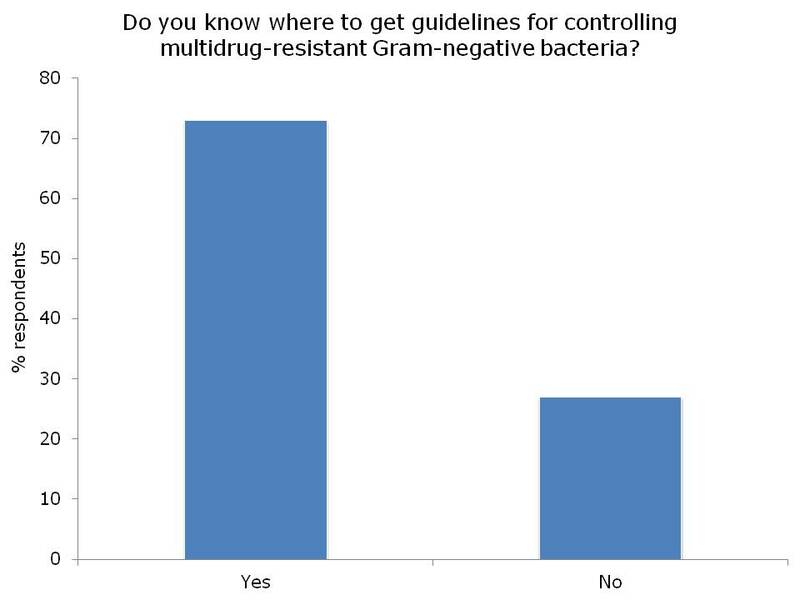 During the webinar, I provided an overview of the available guidelines to control CRE and other resistant Gram-negative bacteria. I then identified gaps in the guidelines, in terms of definitions of standard precautions, outbreak epidemiology and who should be on the guidelines writing dream team. Finally, I discussed some controversial areas in terms of effective interventions: patient isolation, staff cohorting and selective digestive decontamination. One of the most important points when considering infection prevention and control guidelines is the issue of ‘standard precautions’. What do we apply to every patient, every time? 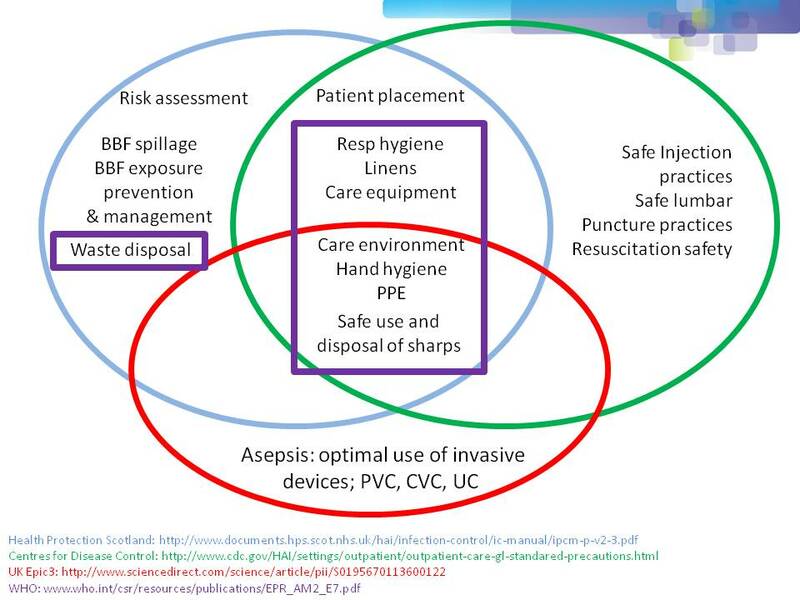 As you can see from Figure 1 below, ‘standard precautions’ is far from standardized. This is problematic when developing and implementing prevention and control guidelines. Figure 1: differences in the definition of ‘standard precautions’. I had the opportunity to ask the webinar audience a few questions throughout the webinar, which are outlined in Figure 2. Figure 2: response to the questions from the 120 or so participants. UK Public Health England CPE Tookit. ECDC risk assessment on the spread of spreading (CPE). Canadian guidelines for carbapenem resistant GNB. Australian recommendations for CRE control. 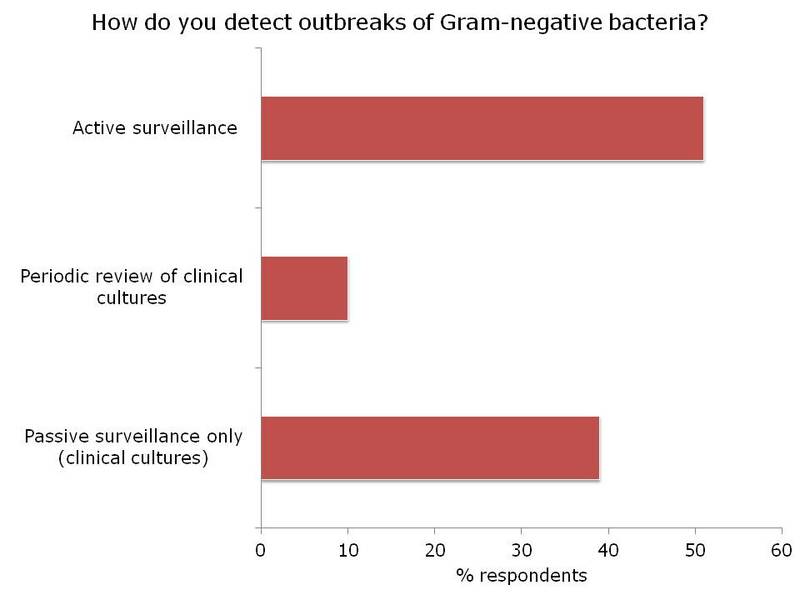 There was a fairly even split between active and passive surveillance to detect outbreaks. The problem with relying on passive surveillance (i.e. clinical cultures) is that there’s a good chance that the ‘horse will have bolted’, and you have a large outbreak on your hands, before a problem is detected. For this reason, I favour active surveillance. But who to screen? In the case of CRE, I was pleased to see that virtually nobody said nobody. There was a pretty even split between everybody, high-risk individuals or all individuals in high-risk specialties. Accurately identifying individuals who meet screening triggers is operationally challenging, as outlined by the “backlash” to the UK toolkit, so I think screening all patients in high-risk specialties (e.g. ICU) makes most sense. So, what works to control MDR-GNR transmission? We don’t really know, so are left with a “kitchen sink” (aka bundle approach) (more on this in my recent talk at HIS). We need higher quality studies providing some evidence as to what actually works to control MDR-GNR. Until then, we need to apply a healthy dose of pragmatism! ESCMID experts recently released comprehensive guidelines for the control of MDR-GNR. Working with a limited evidence base, the experts managed to compile a coherent set of guidelines with graded recommendations. Given the important differences in the epidemiology of the various species and resistance patterns of MDR-GNR, this is really a 6-for-the-price-of-one set of guidelines, with separate recommendations for: ESBL-producing Enterobacteriaceae, MDR K. pneumoniae, MDR A. baumannnii, MDR P. aeruginosa, Burkholderia cepacia and Stenotrophmonas maltophilia. Five key interventions are identified: hand hygiene measures, active screening cultures, contact precautions, environmental cleaning, and antimicrobial stewardship. ‘Selective’ decontamination using antibiotics, topical ‘source control’ using chlorhexidine, and infrastructure / education are also reviewed. Which of these is most important? Most studies included multiple interventions simultaneously, so it’s difficult to tell and it will probably depend on species and setting. Figure: The cornerstones of MDR-GNR control (but we don’t have enough data to say which is most important, and which are redundant). We still don’t really know what works to control MDR-GNR. Reflecting on my recent blog on influenza transmission, where the relative importance of various transmission routes varies by context, this also seems likely for MDR-GNR. The relative importance of say, environment vs. hands, is likely to vary by setting for a given MDR-GNR species. This makes definitive guidelines difficult to write! The guidelines begin with a useful review of the differing transmission routes for the various MDR-GNR species. This shows that person-to-person spread of Klebsiella species and some other Enterobacteriaceae (such as Enterobacter species and Serratia species) seems to be more important than for E. coli. The non-fermenters A. baumannii and P. aeruginosa have some fundamental differences with one another and with the Enterobacteriace in terms of transmission routes. If I had to rate the importance of patient-to-patient spread vs. other routes for the various MDR-GNR I would say A. baumannii > Klebsiella species > other Enterobacteriaceae > P. aeruginosa > E. coli. But don’t hold me to it! It seems odd that all of the recommendations are ‘strong’ but the evidence is graded mainly as ‘moderate’, ‘low’ or ‘very low’. Perhaps more ‘conditional’ recommendations would be a better fit with the quality of the evidence? The recommendations are stratified by organism-group and setting (endemic or outbreak), which is a workable approach. What you’d do in an outbreak does probably differ from what you’d do in an endemic setting. There’s a useful recommendation for the identification of a new CRE case to prompt contact tracing and enhanced local surveillance, in line with PHE and CDC recommendations. There’s a little fence sitting when it comes to a recommendation for active surveillance cultures in the endemic setting: ‘the implementation of ASC [active surveillance cultures] should be suggested only as an additional measure and not included in the basic measures to control the spread of MDR-GNB in the endemic setting.’ Still not clear whether this is a recommendation for or against ASC in the endemic setting! I was surprised not to see a recommendation to use a disinfectant to help bring A. baumannii outbreaks under control. I appreciate that there is little evidence in endemic settings, but controlling the environmental reservoir does seem to be important in controlling A. baumannii outbreaks. The remit of the guidelines is for adult patients, but what to do on neonatal units and in paediatrics? The guidelines are restricted to hospitalized patients, but what about long-term acute care facilities (that are riddled with CRE in some parts of the world) and long-term care facilities (that have an unknown but probably sizable burden of resistance)? The searches were restricted to MDR bacteria according to ECDC criteria, but what about all those literature on preventing the transmission of resistant (but not multiresistant) and sensitive GNR? If something works to control GNR, there’s no reason why it shouldn’t work to control MDR-GNR (except, perhaps, for antibiotic stewardship). Finally, if all else fails (and only then), consider closing the ward! In summary, these guidelines are very well written and will provide useful guidance for those on the front line try to deal with endemic and epidemic MDR-GNR. However, above all else, they highlight the need for high-quality studies telling us what works to control MDR-GNR. Article citation: Tacconelli E, Cataldo MA, Dancer SJ et al. ESCMID guidelines for the management of the infection control measures to reduce transmission of multidrug-resistant Gram-negative bacteria in hospitalized patients. Clin Microbiol Infect 2014; 20 Suppl 1: 1-55.